Finally getting back into modding. 1) Thrunite TH20 Headlamp, change LED to 219C 3500K 90 CRI. Loving this headlamp now. So much more pleasant and calming than stock LED with wonderful color rendering. 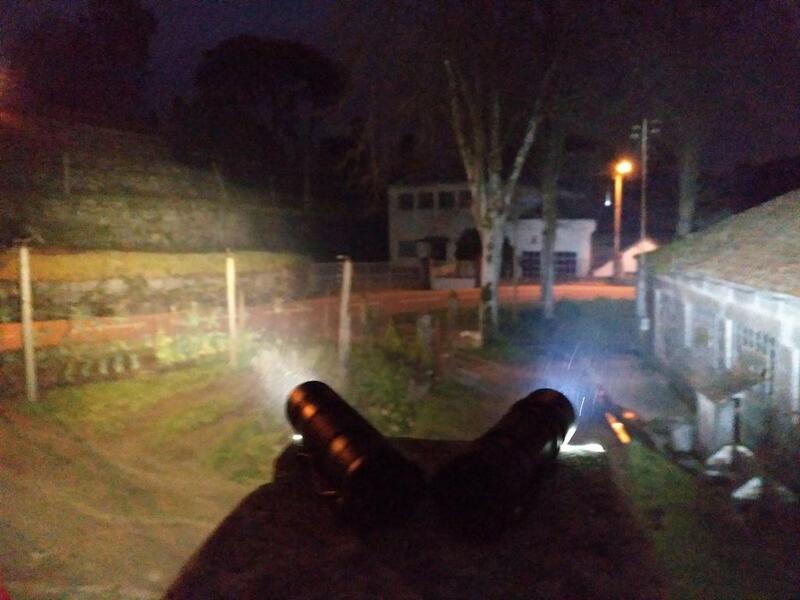 2) Eagletac M30LC2-C, changed XP-G2 70 CRI Leds to Luminus SST-20 3500K 95 CRI Leds. There is a noticeable drop in output with the new LEDs. The light out throws my Zebralight SC600w MK III Hi by a small but still noticeable amount. The center intensity is higher than the Zebralight, but the spot is much narrower too. Its my first high CRI “thrower” and I am very impressed by the color rendering of these LEDs. Its refreshing to see colors pop from a distance. It makes reds/browns pop much more than the 3500K Nichia 219C above. The best part about this light is that it maintains the highest level without overheating at all, and its fully regulated. 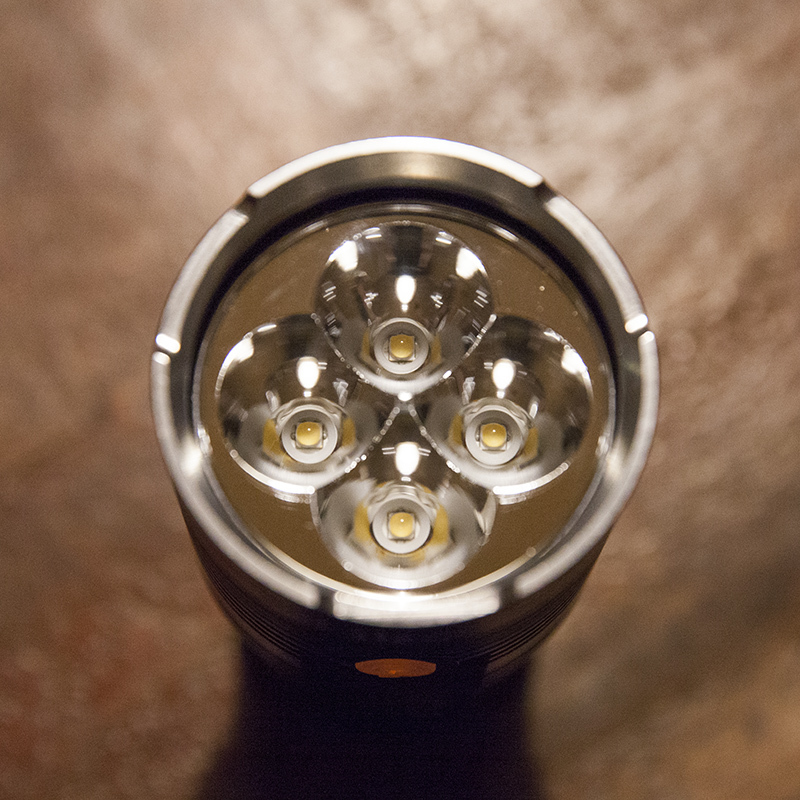 My guess is that it now outputs about 750 lumens, but this is purely a guess based on my perception of other lights. The spill is quite dim compared to the main spot so its very good at not blowing out your night vision so you can focus on the center spot in the distance. 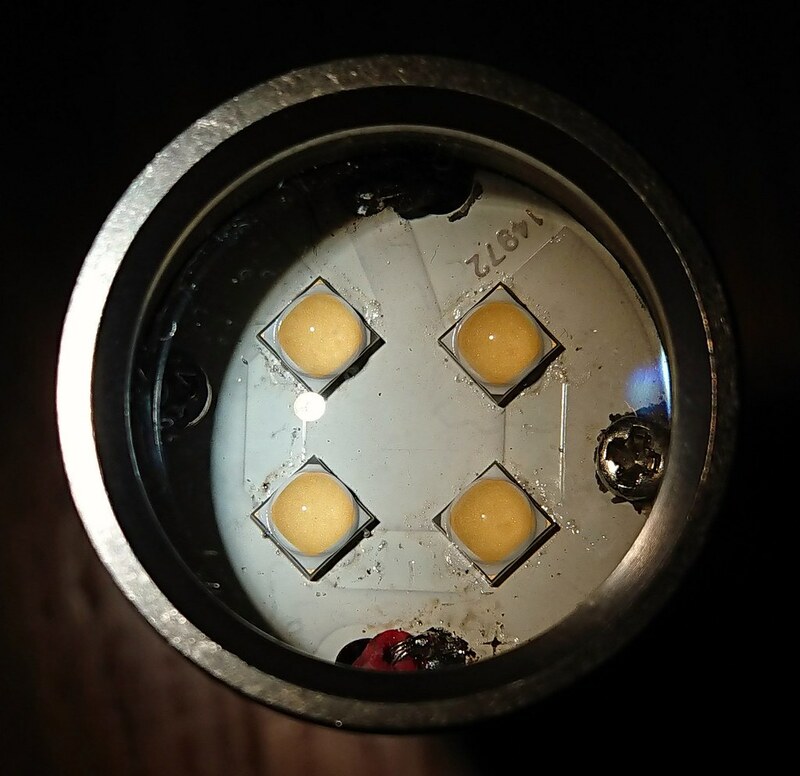 I am curious to see how an XP-L Hi 80 CRI 4000K Led would do in this light, but sourcing these seems expensive. Modified TomE and TK’s RampingIOS to run on the new attiny412 (and in single-channel mode). Loaded it up on my D25 headlamp. The UI is so much better now (vs the D25’s original UI)! Full details in this post. You say that (“the UI is so much better now!”) as if there were something wrong with ToyKeepers UI to begin with. Edit: Ah, I am going to assume you mean the light is better with Anduril Ramping IOS than with the OEM UI… sometimes I’m so dense. Edit: Ah, I am going to assume you mean the light is better with Anduril than with the OEM UI… sometimes I’m so dense. Yup, I definitely meant “better than the D25’s stock UI”. Thanks Dale, I just added clarification. Modified TomE and TK’s RampingIOS to run on the new attiny412 (and in single-channel mode). Loaded it up on my D25 headlamp. The UI is so much better now (vs the D25’s original UI)! Full details “in this post”:http://budgetlightforum.com/comment/1464235#comment-1464235. Did a emitter reflow on a Coast HP1 today. I have two of them, given as gifts some time ago. And they rarely see any action. Mostly because they have a horrible cold white blue 6000K+ish emitter. And they are zoomies, which I’m not a fan of. Now, given my recent “level up” into the world of reflowing, why not give one of them a proper emitter. I had a SST-20 J2 JC1 2700K CRI95 laying around, mostly to test how Luminus’ take on a 2700K performed. Hacked together a 4.15$ C8 and an e-switch TC driver running Anduril. It kind of works, still has issues and I’m not even sure if this is a heresy or not. Interesting. Pics or additional details? How do you have it wired up? A C8F host is so cheap, easier to go with a light already setup for e-switch. Just wish they made a 1 LED version of the C8F host. Would be a cheap mod for sure. Only a driver pic so far, it’s still quite a mess. I’ll do a writeup if I get this to work reliably. 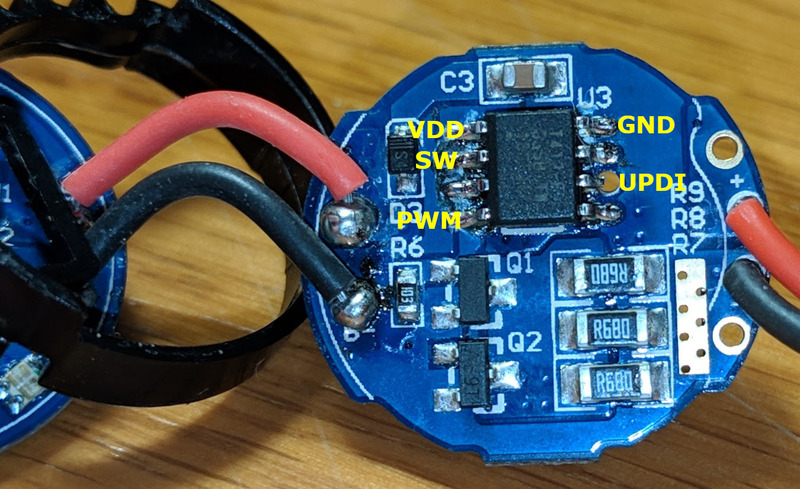 The setup basically is this: there’s a ~100R bypass resistor in the head parallel to the LED so that the body functions as the positive pole (when the LED is off). In the tail, there’s a 47µ filter cap behind a diode. You rely on PWM to keep this cap charged, this means you have to stay below a certain duty cycle. 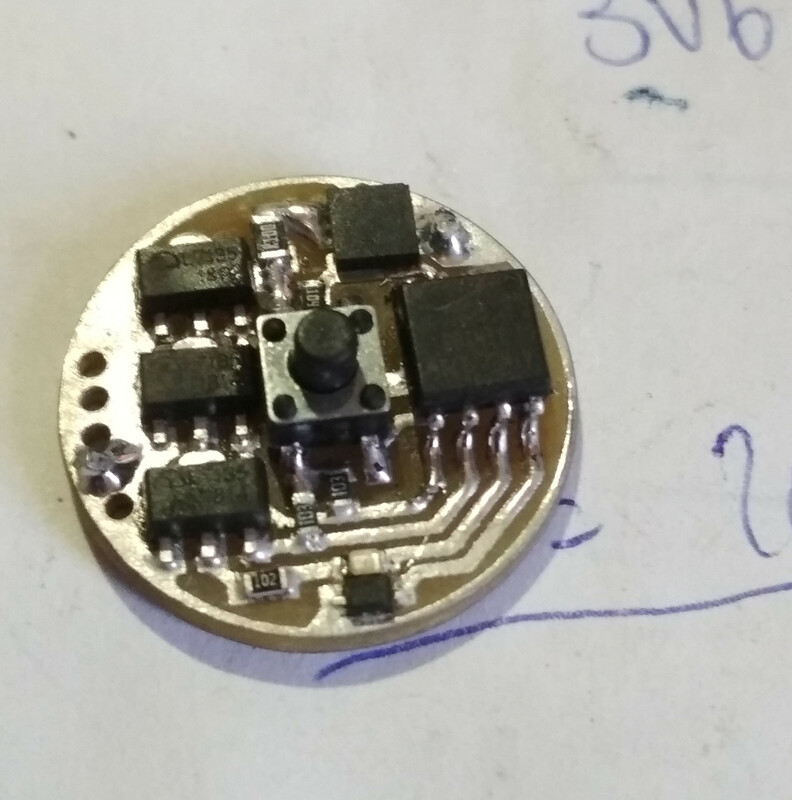 The rest is pretty much a standard ATtiny 85 driver 1+n+FET(w/shunt). I pretty much had it stable when running from a lab supply so the error can’t be that far. Yes but where’s the fun? It already exists, and anyone can have it. Ohhh, ok - you are doing what CK did with a Folomov 18650S custom driver mod. This is pretty cool! Maybe Anduril is doing LVP stepping down, not thermal? Is it getting good batt+ voltage? Hope you get it worked out, this would be really nice! How you doing the PCB stuff? It's not OSHPark you got there. I see our typical parts for the FET gate resistors. Not sure what those 10K's are doing though, maybe that 1K is for the AUX LED. Ohhh, ok – you are doing what CK did with a Folomov 18650S custom driver mod. This is pretty cool! Hope you get it worked out, this would be really nice! How you doing the PCB stuff? It’s not OSHPark you got there. I see our typical parts for the FET gate resistors. Not sure what those 10K’s are doing though, maybe that 1K is for the AUX LED. 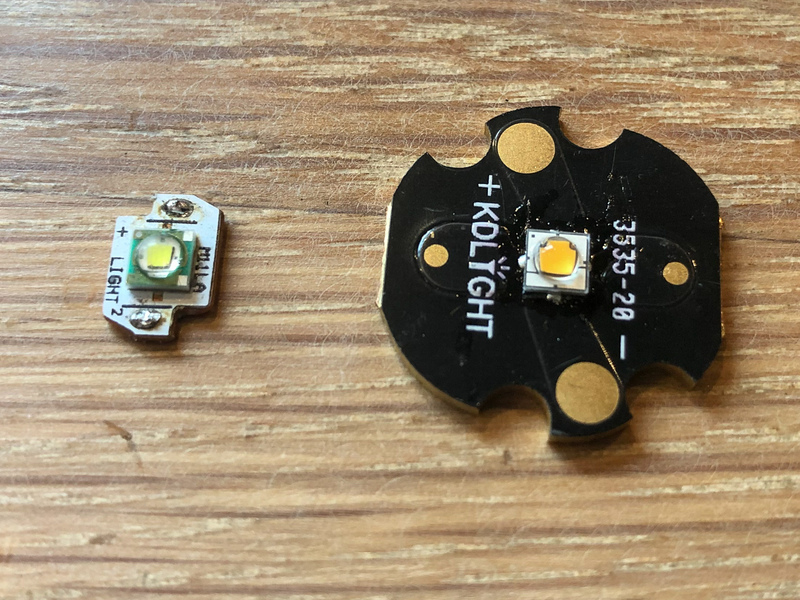 1k is for the switch LED, 10k are pulldowns for the 7135s (the ATtiny only has internal pull-ups so this was intended for stability but may not be needed at all. ) The cap and the RST pullup are tucked away under the µC. It’s made 90s- style: laser printer, glossy paper, clothes iron, FeCl3. If I don’t rush it I can get down to 0.5mm pitch. Downside: 2-layer gets tricky; upside: lead time is half an hour or so. Costs: a few cents. 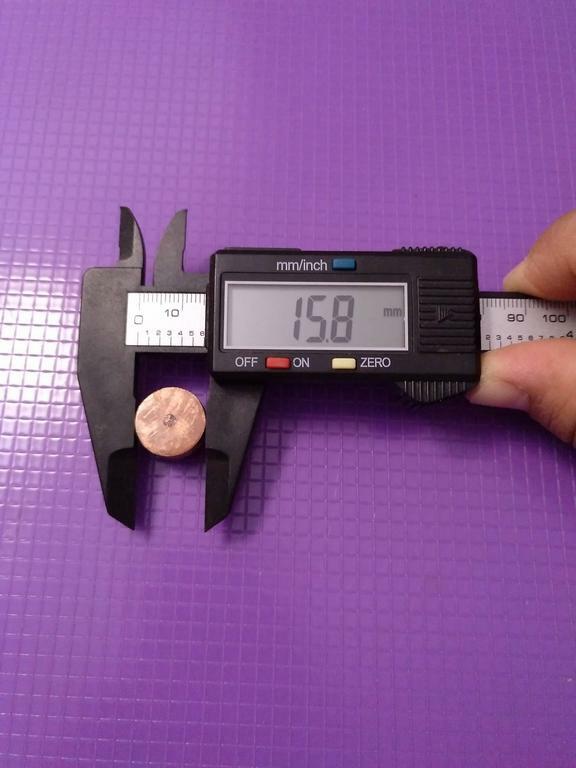 Wow, making a PCB in a 1/2 hour for a few cents ain't bad.. I'm not familiar with this technique but I'm gonna ask around for sure - nice ! I’ve heard of that, but never tried it. I think CRX used it in this year’s OL contest. Wow, making a PCB in a 1/2 hour for a few cents ain’t bad.. I’m not familiar with this technique but I’m gonna ask around for sure – nice ! I’m interested in how that was done. Homemade PCB in 1/2 hour for a few cents? … sounds lovely!!!! My buddy EE here said he was etching his first PCB's before high school - we're talk'n the 70's. 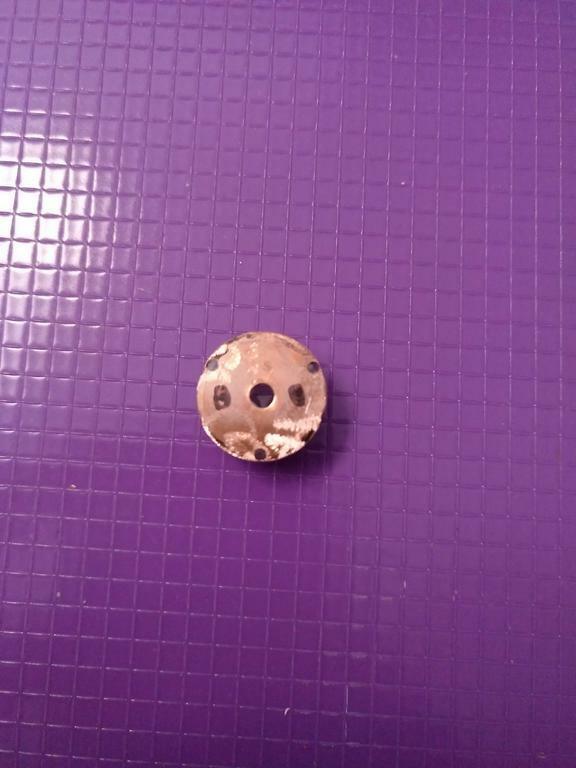 There's not much to it really, but without simple small thru holes, it can get dicey for us. You still have to design your circuit layout and use a graphics app to draw it (probably a PCB design app). Old days with bigger parts and fatter traces, you could use a permanent marker to write directly on the PCB for etching out the copper. Aye, that’s how it’s done. 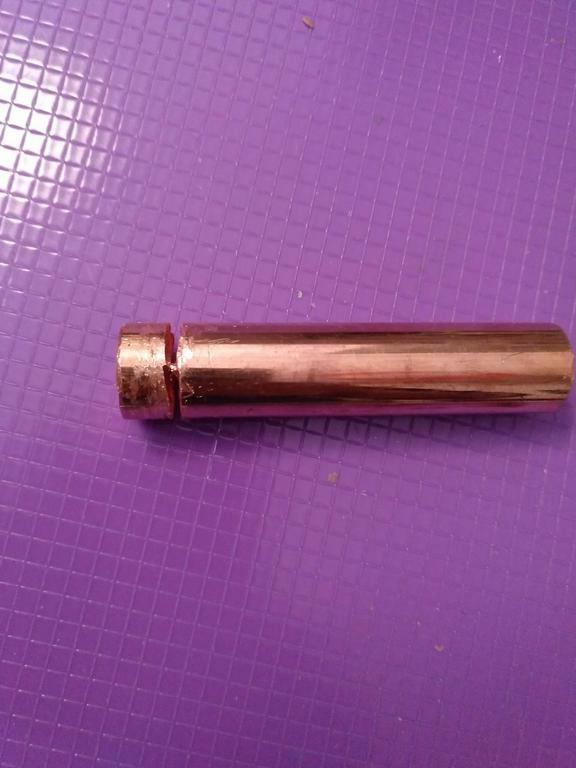 Some people use a laminator to fuse the toner to the PCB, it makes it a bit easier (If you’re too hot or apply too much pressure, the toner gets squished and spreads out – this happened here but not too bad. If too little, it doesn’t stick.) 2-layer can be done but getting both sides aligned can be tricky and overall it’s more complicated. If I can get away with it, I try to cram everything onto one side (except for filter caps etc.) 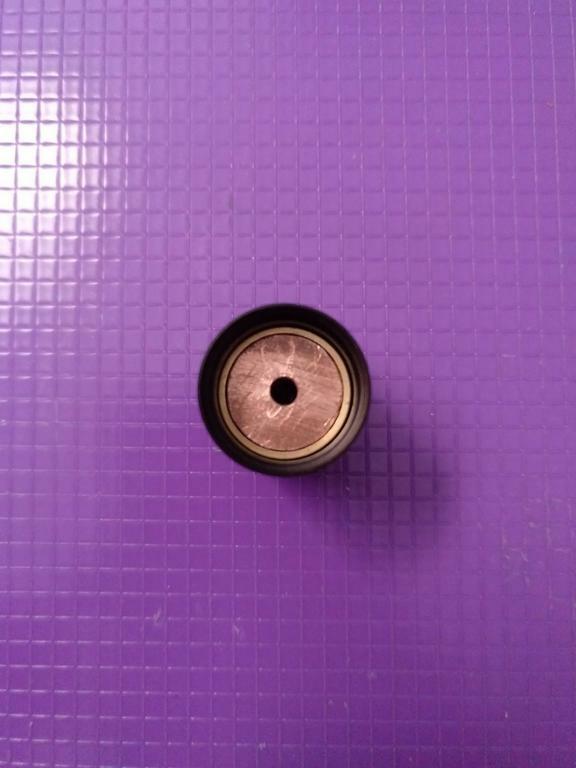 In this case, the other side is just 2 milled concentric rings. On vias – some people have come up with DIY methods for plated through holes (PTH), but again, it’s quite involved. 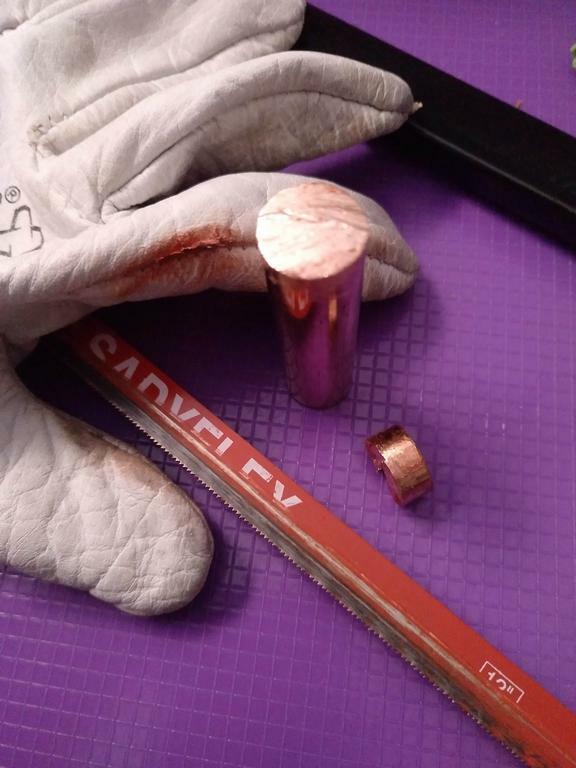 It’s an electroless copper method where first you have to coat the inside of the holes with ITO or conductive silver plus some sort of catalyst before plating. I don’t think it’s worth the effort for small one-offs like this one. Another way would be rivets like these – looks sensible for bigger connections. 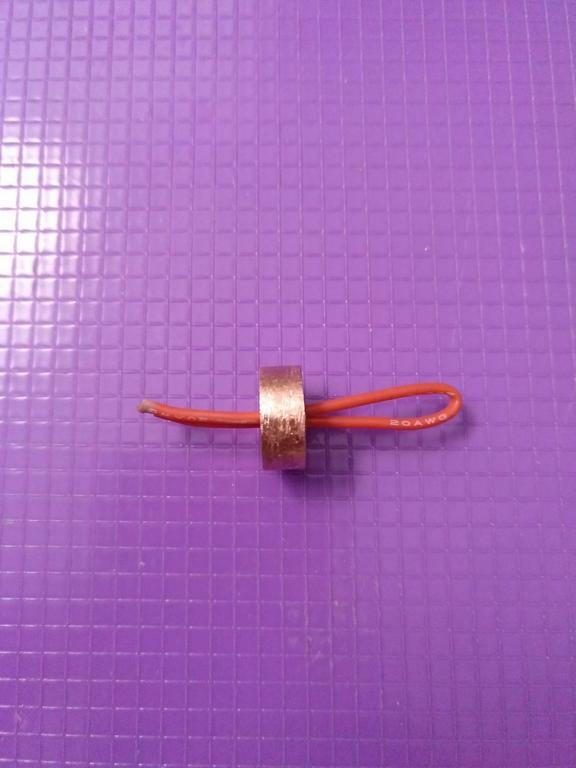 I just use a short piece of copper wire. 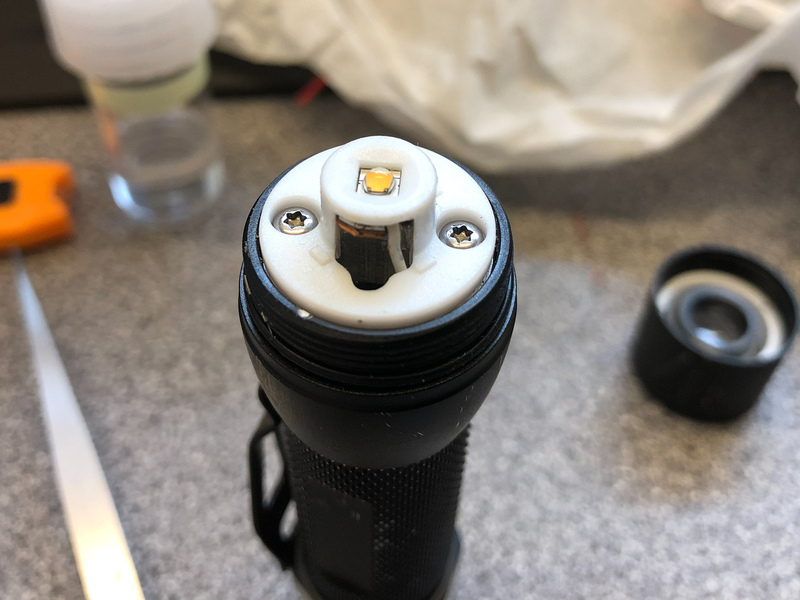 First time modding a flashlight today, was pretty fun and surprisingly easy. 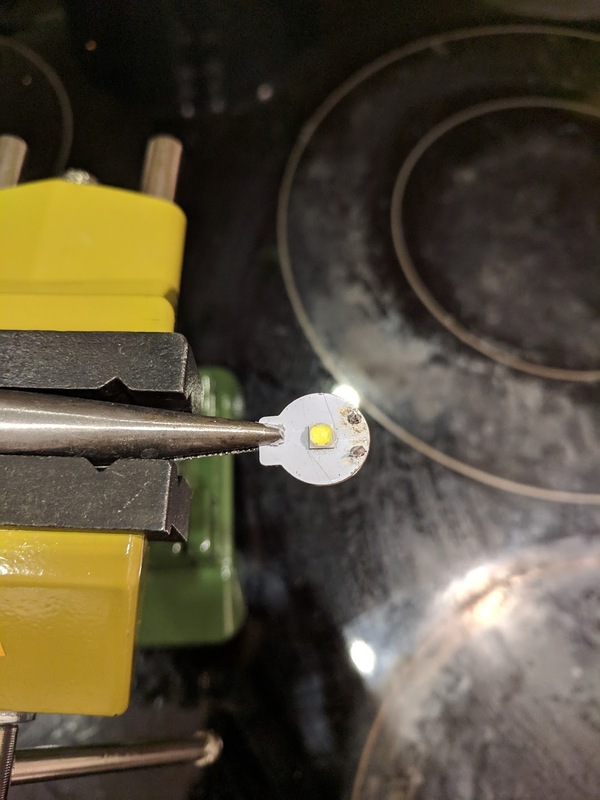 Emitter swap on a BLF Q8 to some 5000K LH351Ds, swapped the switch LEDs to orange, and flashed Anduril. All in all a productive evening. First experience with the LH351Ds too, ordered them from Arrow after reading some favorable reviews and I’m happy I did. The tint is far nicer than the stock XPL emitters. Nice Q8 mod, I like the orange switch led’s. 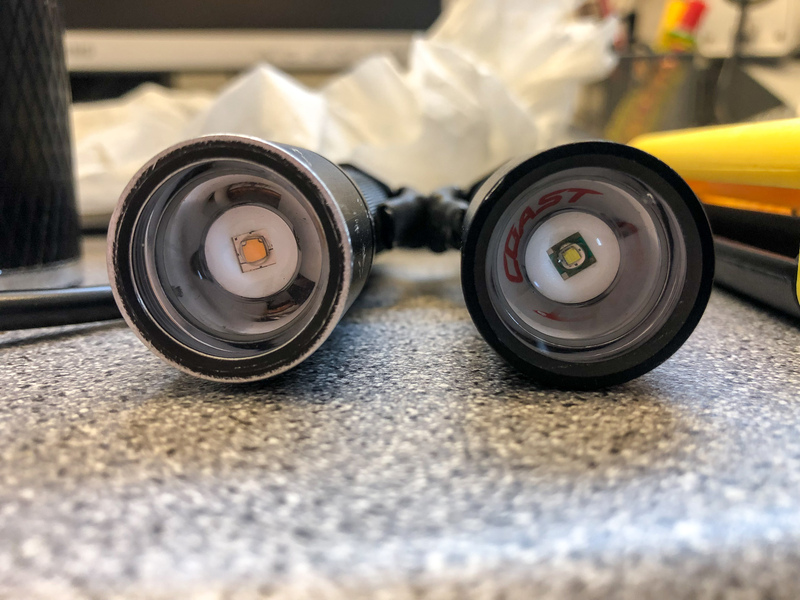 That is a nice Q8 mod, but wondering how/why the 5000K 351D's look so much better than the 5000K 3D XPL's shipped with the BLF Q8 unless they changed them. From the maukka tests, it's hard to tell: http://budgetlightforum.com/node/57579, but the LH351D appear to be above the BBL, but not really sure, and I don't know how the XPL 3D's compare. What DB Custom said, essentially. I found the XPL 3Ds to have an off-white tint with a bit of green mixed in and a rather unpleasant tint shift in lower outputs. The Samsungs on the other hand produce an extremely clean, pure white beam at all outputs from what I can tell, and are also high CRI which adds to the noticeable difference. Same thoughts about the XP-L HD 3D. Ohh, you used the 90 CRI 5000K, not the 70 CRI. I have the 70 CRI's in 5000K, used one so far, and looks good, but haven't spent much time with it, or comparing it. everything I have tried the 80 or 90CRI ones in (probably 10 lights across 3-4 different LEDs) produces a good even beam which is the only knock on the XP-L 3D is that it shifts throughout the beam some. 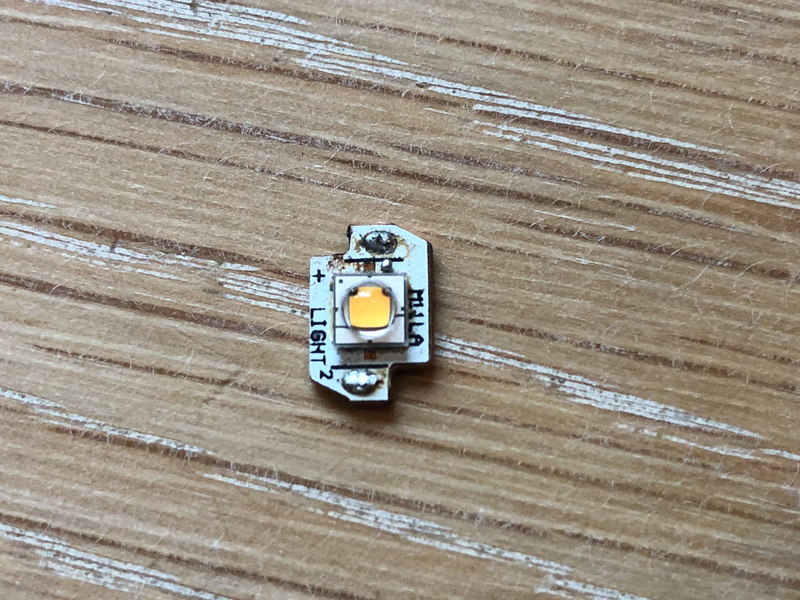 a lot of the LH351D are above BBL so could have some green but at least it’s generally even throughout the beam unlike the some of the XP cree emitters that might have a great hot spot but the corona and spill are noticeably different tint. This evening I put 4 of those 5000K 90CRI LH351D leds (by coincidence another mod with these is described above (nice Q8 DarkShot!) from that Arrow deal into my Amutorch AT40. 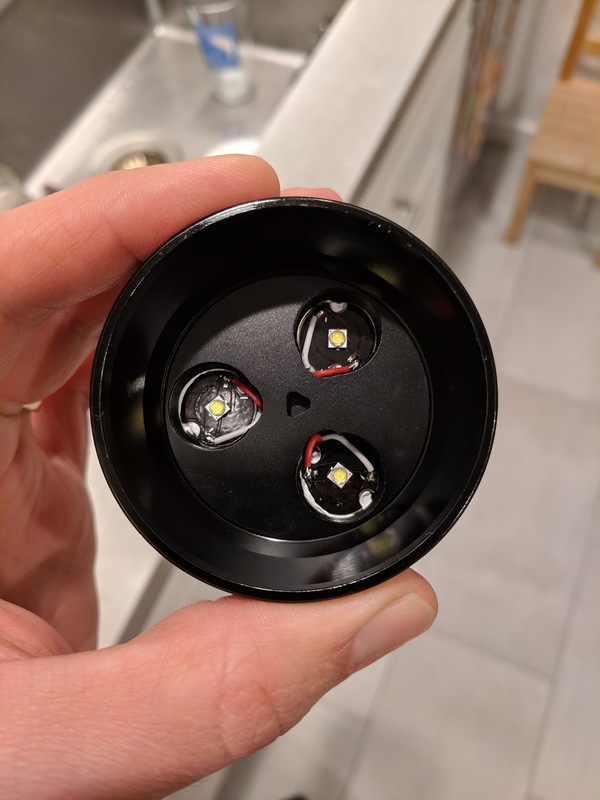 I know that maukka tested these leds to be somewhat green in a reflector light, so in AT40 they may perform a bit nicer. 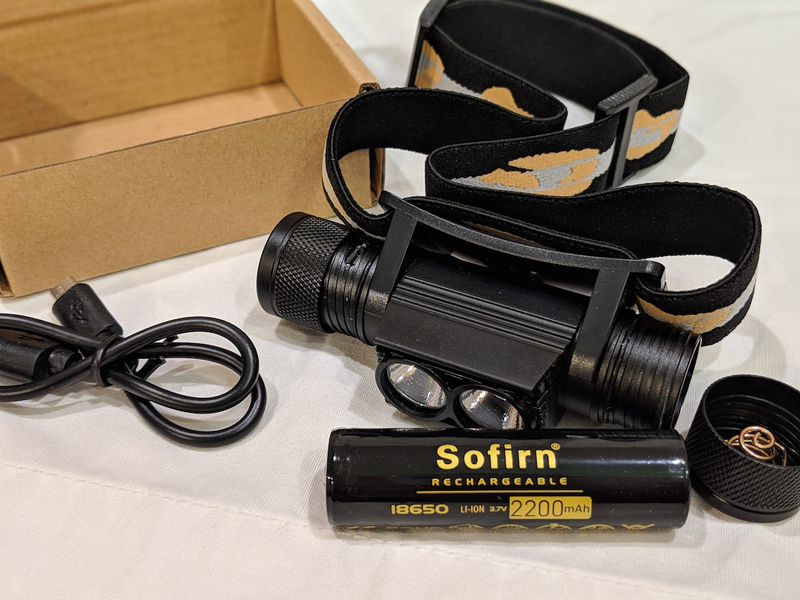 The AT40 is basically a mule light with just a weak lens to give the light some direction, so it makes use of the forward directed light from the leds, in contrast with a reflector light where the spot is formed by light that comes sideways out of the led. In all leds that I measured sofar the forwarded light is the rosiest part, and indeed the broad flood that now comes out of the AT40 is under the BBL (even on lowest mode I get 5200K duv -0.0056). The CRI is around 95 in all modes with a R9 around 80. 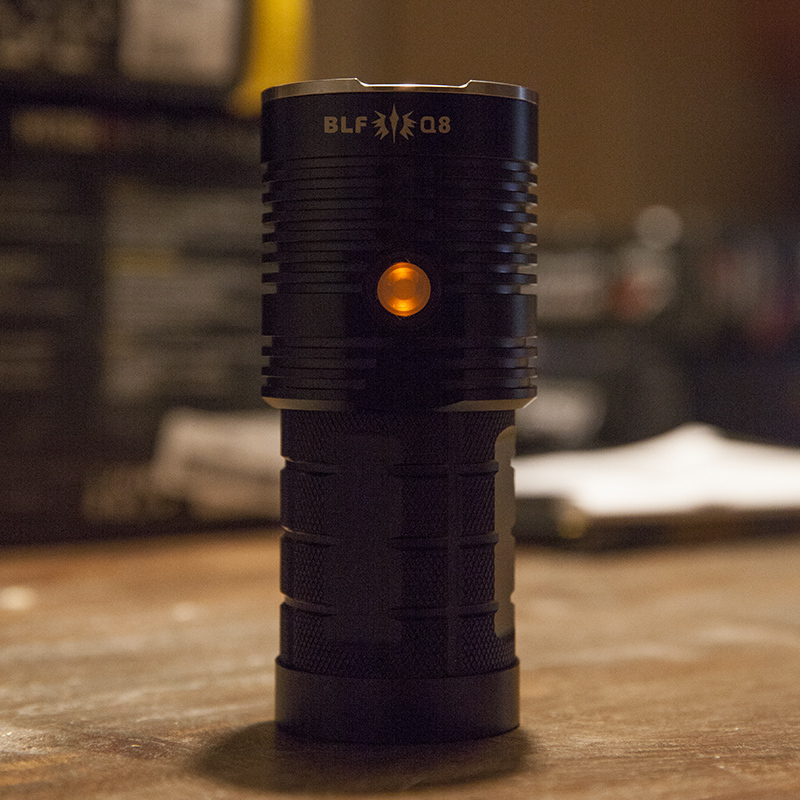 Output on highest setting is 730 lumen. Cheers djozz, solid work too! Disassembled and flashed Anduril to my D4. Royal PITA to get it apart, ended up destroying two resistors in removing the driver. Fortunately I had some SMD resistors close to the value of the two ruined so they were replaced. Totally worth the effort though, Anduril is fantastic. Last Friday I received some goodies from Led4Power and finally ended a mod I started in November! 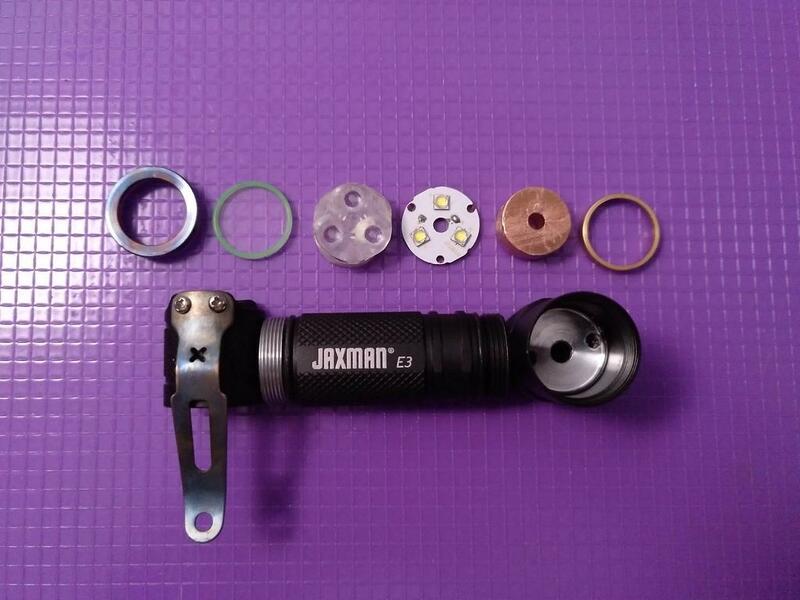 I moded the Jaxman E3 into a triple, and changed the driver and LED of the Convoy T2. 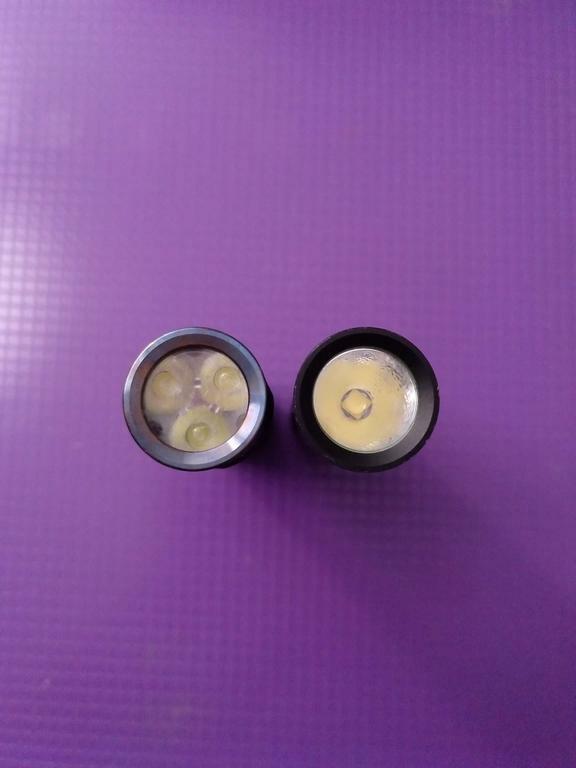 No pics from the mod on the Convoy T2 , only some beamshots! 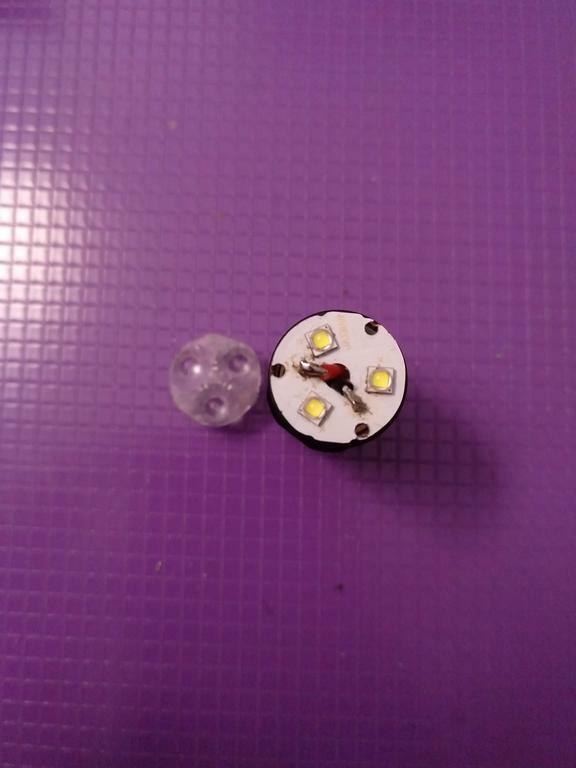 I must mention that if someone wants to mod this light, the MCPCB must be around 14mm. 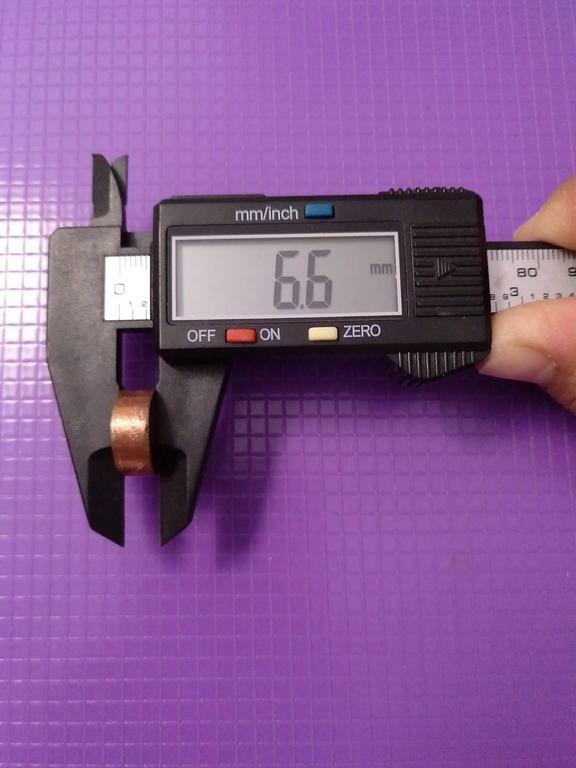 There is a ring that protrudes all around the shelf, and that hinders 16mm MCPCBs from fitting correctly. This said, I reflowed a Luveon V 4000K in a old “shaved-to-14mm” Led4Power MCPCB. 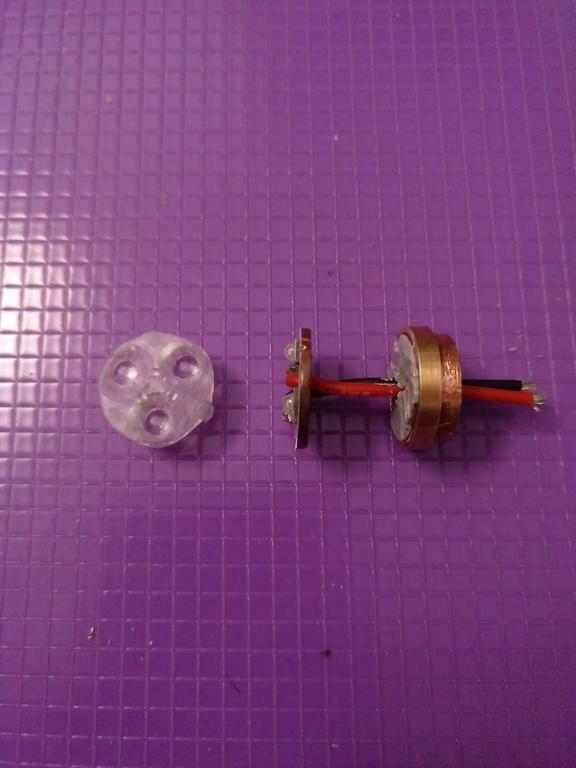 I used a 4-6A LD-A4 driver also from Led4Power, with a spring cut to half to make the battery fit. 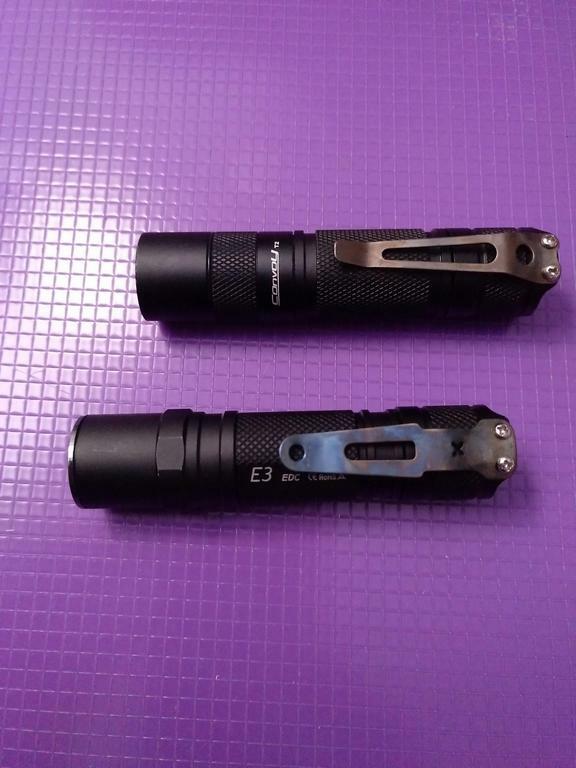 I also put another type of clip borrowed from the Amutorch S3 (stainless steel), and I “flamed” the clip with a small lighter/torch (sorry, can’t remember the proper expression for this process ). I started this mod in November. 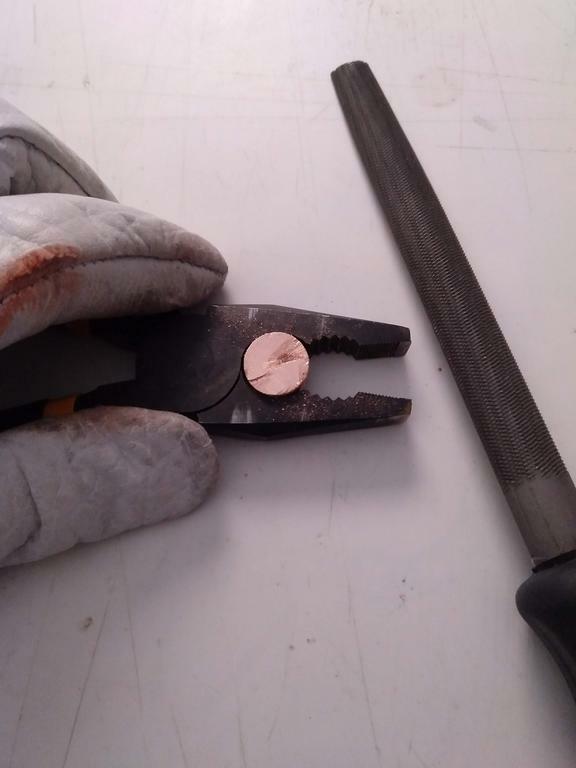 Back then I started with a 16mm copper rod to make the pill; I cut it by hand and filed to make it for the flashlight. It was bought in a local store. 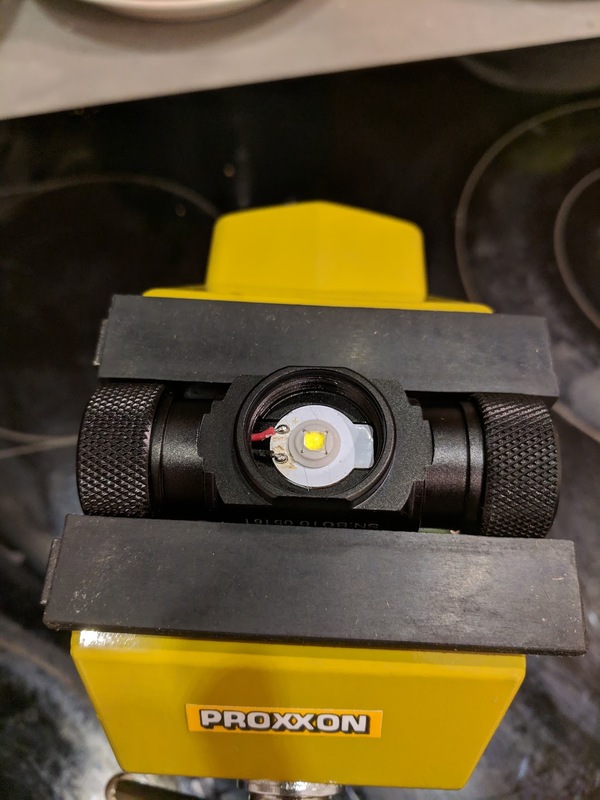 I drilled a hole in the shelf of the flashlight to make the wires (20AWG) fit. The driver is a 7-9A LD-A4 from Led4Power. 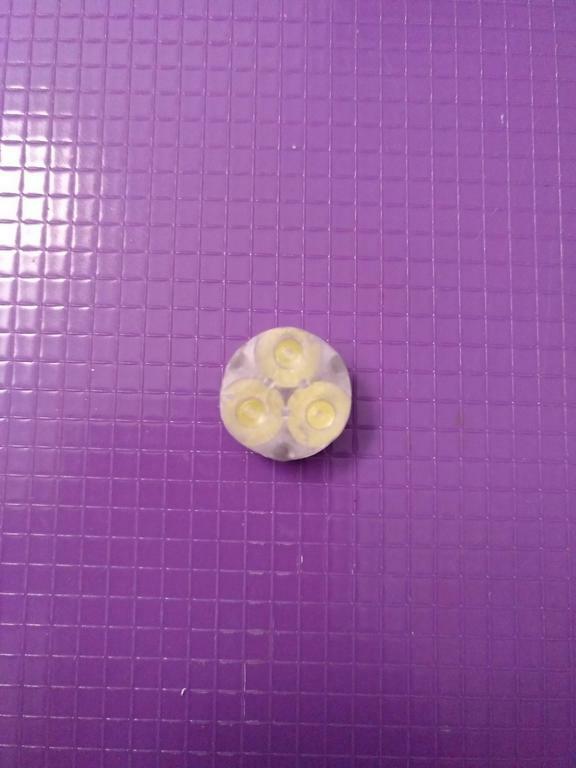 Around the pill I used a spacer bought some time ago in KD store from AliExpress. It helps a lot holding the pill in the correct place and it was perfect for this. The pocket clip is a spare one from Nitefox ES10K, and I also “flamed” it with a small torch/lighter. Did the same with the bezel. The threads form the T2 and the E3 are equal, so the parts are interchangeable. I wish the E3 had a round battery tube so that the clip was correctly aligned. I am still thinking about the possibility to add something between the tube and the tail cap of the E3, to make it align correctly! 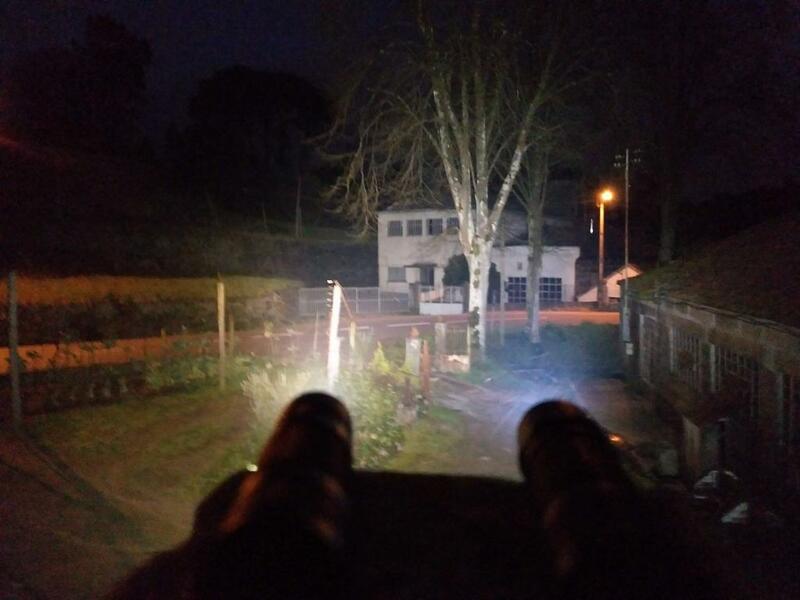 The night beamshots are on Max output, with and EFEST IMR 14500 650mAh. Oh, thats no good mcpcb-design! I would change it, that you have + at the inside and not at the outside of the mcpcb. That would be safer. 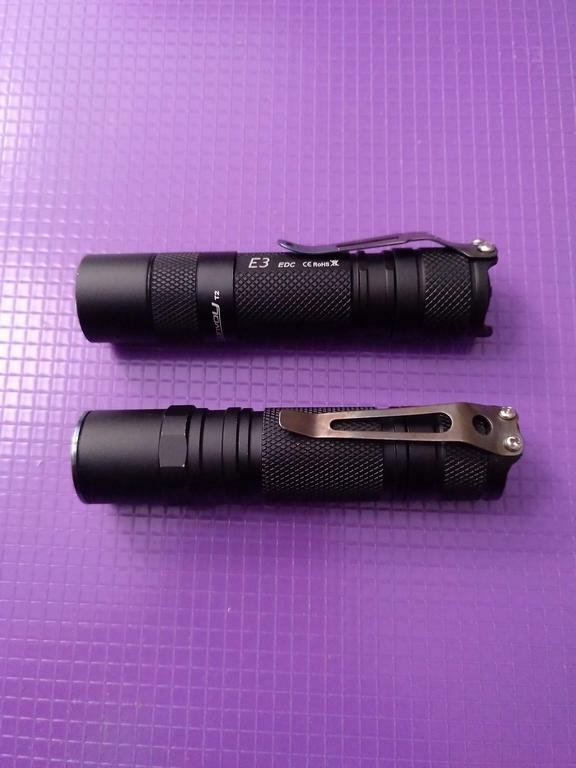 Remember the first Astrolux S41 flashlights, they had a similar design and some problems with shortcuits. Oh, no worries, that is not the only thing that is designed badly on this light The beam would improve drastically if the leds were placed closer together, I do not see one reason why that would not have been possible. It would even allow for a slimmer head. And I frosted the inside of the lens with fine sand paper now, that removed a ton of beam artifacts. 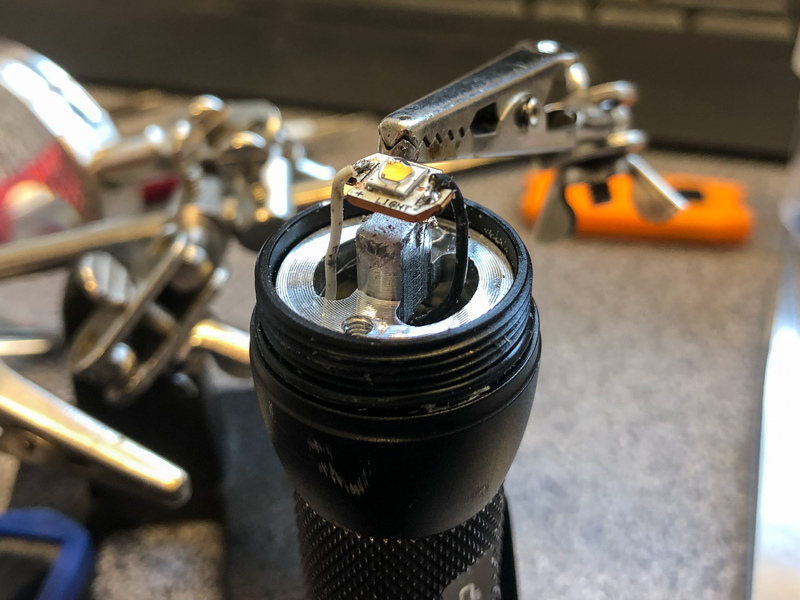 I’m now at 650 lumen OTF at 2.94 A current, so total efficiency of close to 60 lm/W which is pretty ok for a 95CRI on top of BBL flooder.